The popularity of hero-centric multiplayer has taken gaming by storm over the last few years. Seeded by MOBAs like League of Legends and DotA 2 and spreading to the likes of Overwatch and Battleborn (R.I.P.). These games didn’t invent the concept of course, but it’s certainly become much more trendy. So, what would you say to a simple but deep hero centric turn based strategy game in a unique fantasy setting with day and night cycles during play that can completely change the face of a battlefield? All on mobile? I say heck yes. This is Little Lords of Twilight (Free). Bkom Studios has struck out into the world with this interesting gem. It’s a very experimental game in many ways. Turn based strategy games with special hero character units are as replete as real time strategy equivalents, but I’ve never seen such a hero focus. Every hero is the centerpiece of the battle. You win by either killing the opposing enemy hero, or by getting to the enemy hero’s gate and staying there for one round. But a turn based strategy with one unit on each side would be silly. The solution? Summoned units. Every hero has 2 unique units that it can summon near itself. You can only have one of each unit out at a time, so these 1v1 matches are more like 3v3, but you can summon an infinite number of replacements. The day and night cycle is key. Each Hero is drastically different during a SunPop and NightFall as they’re called in the game. Unlike Lost Frontier ($2.99), where every round switched between day and night, each cycle lasts 4 complete rounds. The lighting actually shifts a bit every round and the stage of day is always tracked in the top left corner. The cycle affects things like movement speed, attack range, and attack strength. 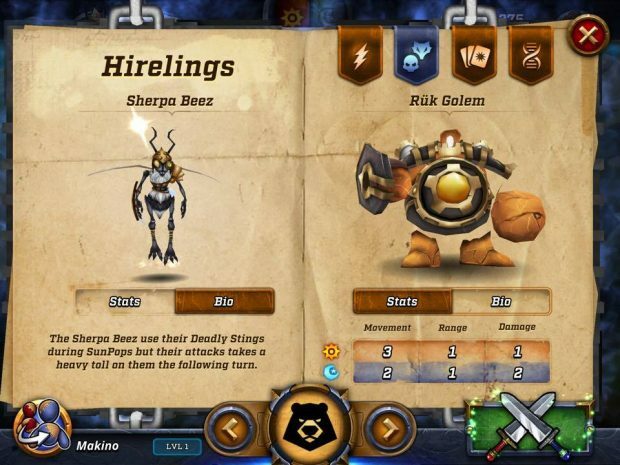 There are currently three heroes in the game, but they’re each unique and offer a pretty wide variety of strategies based on their level. As you play with a hero, they’ll level up and gain access to special abilities. 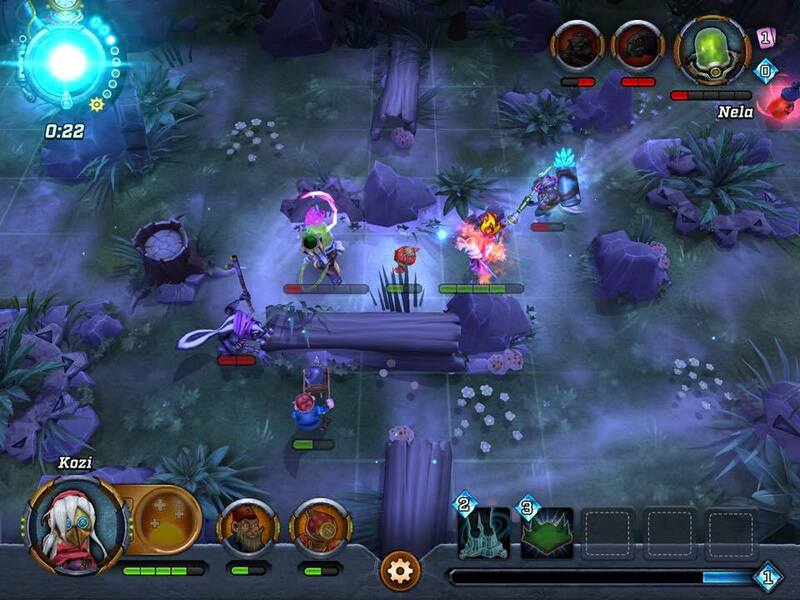 Every hero has 12 abilities total: 6 Active abilities, 6 passive abilities, 6 SunPop abilities, and 6 NightFall abilities. You must choose one passive and one active. You can choose to set both abilities as either day or night abilities, for example, if you want to be extremely powerful when the cycle shifts in your favor. In addition to all this, there are spell cards that randomly shuffle into your hand based on the deck you’ve built. These include hidden traps that can stop a unit dead in their tracks (sometimes literally), offensive spells that directly deal damage and status effects, shield spells, spells to destroy a square of terrain, healing spells, you name it. Certain spells can only be used during day or night, again letting you center your strategy around a certain cycle. 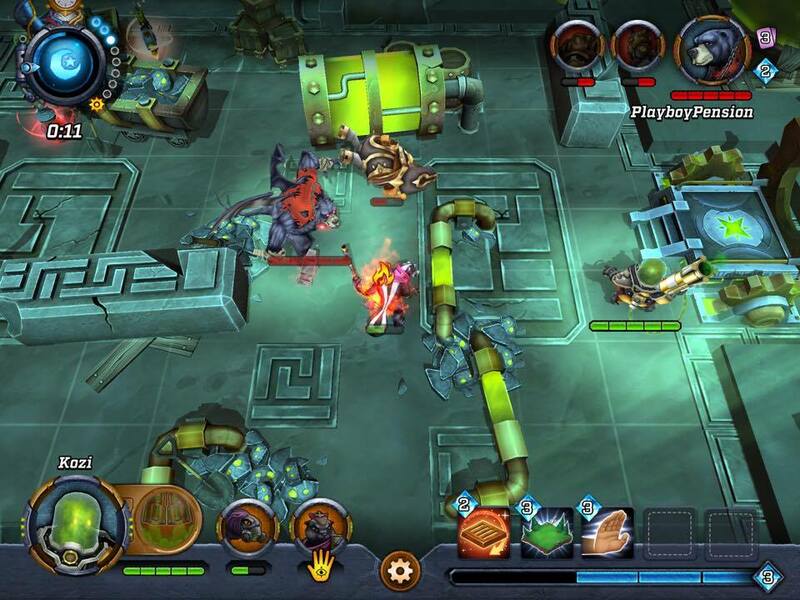 Positioning is key in this game, as you can’t move through friendly units or past enemy units. If you come within one square of an enemy, your move is halted. This is called a guard zone. You can also find health and mana potions on the battlefield, along with movement speed boosting potions and talismans to instantly shift the day/night cycle. With all the mechanics basically outlined, let’s talk strategy. The three heroes are Pestipew the gas shooting skunk, Veroline the doll possessed by the spirit of a young girl, and Makino the mechanically minded bear. So, for some examples of tactics, Veroline can unlock an ability called NightFalls Berserker, which allows her to ignore guard zones completely. I love using this move in conjunction with some movement speed upgrade to blow straight past the enemy and dash for their gate. As long as I don’t let them see which passive I have beforehand, it works like a charm. Information is power in such a game after all. You don’t know which active and passive an enemy hero has until you see it in action. You also don’t know what cards they could potentially have, save for the 10 that everyone starts with, making new spell cards a serious game changer. Another fun strategy is making use of Makino during the night. 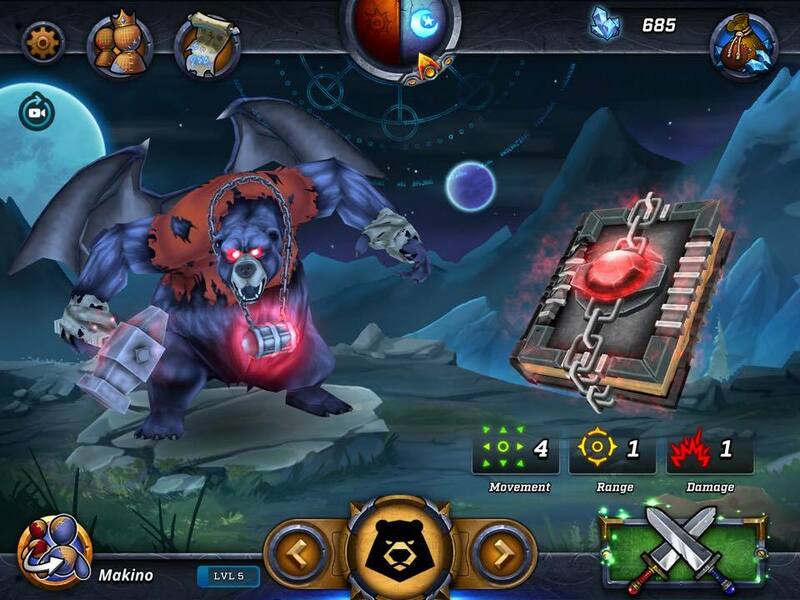 Makino is a kind of vampire were-bear that can fly at night, letting you skip right past guard zones or traps. (Pro-tip: Even though traps are always invisible when placed, the hero will always face the direction of the trap as they cast, giving you at least some idea of where it is). One of Makino’s units, the Ruk Golem, does 2 damage per attack instead of 1 at night, and Makino has an active that lets him shield the golem. Shields soak one attack, regardless of damage. So when NightFalls happen, I go all out on the offensive. Each hero has 5 health, and if you play your cards right, literally, you can annihilate them in one turn. In one great moment, I jumped in front of an enemy Pestipew going for my gate. I hit him with a basic attack, used another unit for another basic attack, then used a 1 mana NightFall spell card to deal another point of damage, and finally used the extremely useful 3 mana ‘MadZik Shove’ to push him into range of my Ruk Golem for the kill. MadZik is what they call magic in this world of Zikverland, by the way. A hero can only use a basic attack, active ability, or summon on their turn, except for MadZik cards, which you can use at any time as long as you have the mana to cast. Once you do one of these main actions, you won’t be able to move either, so keep that in mind. You must move beforehand. As you can see, this system offers a lot of possibility and depth with so many variations on spell decks and hero abilities. I’ve gotten each hero to at least level 5, and I’ve found strategies that I enjoy for each. Bkom Studios is doing something kind of totally crazy here in my opinion. Because there is no single player or same device multiplayer, save for the one identical practice scenario, and all online multiplayer is live. That’s right. No asynchronous multiplayer. This seems super dangerous to me, since it will limit the amount of people you can play against and having a thriving and active community is vital. At the same time, they’ve built the whole game around these engaging, live, active battles. Each character only has 45 seconds to complete their turn. And if someone disconnects or rage quits, as will happen often, they’re given 15 seconds to get back in the game or the win goes to you. Everything is centered on the multiplayer and the leaderboards, which I became quite invested in. I managed to crack the top 100 players. My highest rank was 77, but the game uses a point based system and I’ve been surpassed. The more you win, the more points you get, in lower and lower amounts, and the higher you climb. Naturally you lose points when you lose matches. So being at the top requires both consistent play and consistent wins. I’m really hoping we’ll see more offline content, as I’d love to practice without being stuck on the same map with Makino always as my opponent. Maybe with difficulty levels too. One big thing I didn’t like about this game was the economy. As you play you’ll earn MadBlings, which are the gems you use to buy new spell card packs and skins for your heroes. Any skin will only apply to their day or night time forms and costs 5000 Madblings. The lowest level card pack costs 2000. A dollar of MadBlings in the IAP area gets you only 1000. 5 dollars for 5,300. You don’t earn MadBlings naturally very fast. You can watch 5 ads per day for 250 total, pick up your daily free bonus of 100-200 or so, and complete a daily quest for around 200 to 300. Personally, I’d be much more likely to support the game financially if things were more reasonably priced. Saving up for the most basic card pack and take a good while, let alone the 5,500 and 10,000 ones. 5000 or nearly 5 dollars for a skin that only applies to my character half the time seems very steep. There’s currently a legendary NightFalls skin for Makino that can only be bought through IAP, and it’s $9.99. That said I did get a starter pack for 7 bucks because I wanted to give the game some support. Ragging on freemium elements aside, this game is super cool. I’ve really enjoyed my time with it. It’s a bit of a slow burn title, and it’s a little grindy in the leveling, but as you learn and explore the mechanics it only gets better. There are some bugs, including visual ones that mess up the interface, but Bkom has been diligently patching. It definitely needs more heroes, but with so many abilities and stats to consider for each hero, I understand this will take time. Balancing all of these elements has to be like spinning plates. I’ve been following their progress on the game’s site. They’ve also included native recording and streaming straight from the game, which is neat. I hope to see that 4th hero in the promotional art and trailers sooner than later. 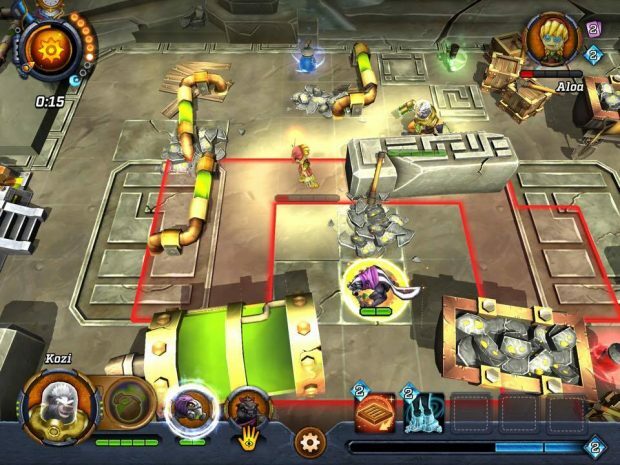 Don’t let this one pass you by if you like strategy games even a little bit.